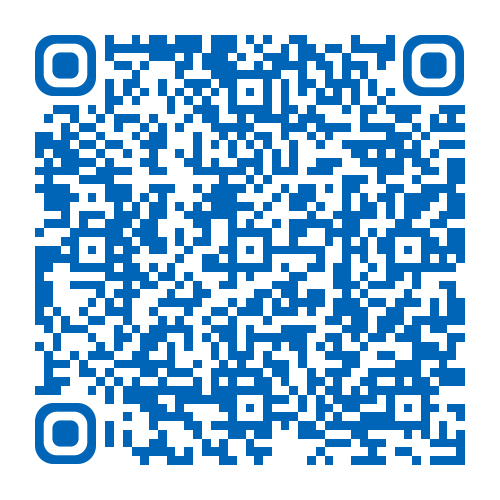 This leaflet has been produced to give you general information about your injury. Most of your questions should be answered by this leaflet. It is not intended to replace the discussion between you and your doctor, but may act as a starting point for discussion. If after reading it you have any concerns or require further explanation, please discuss this with a member of the healthcare team caring for you. Stiffness and loss of function. What if I need pain relief? To manage your pain it is advised that you regularly take simple pain relief which can be bought over the counter. If you have allergies or conditions which prevent the use of pain relieving or anti-inflammatory medication, please seek advice from your General Practitioner (GP) or a pharmacist. What should I do in the first 72 hours after the injury? Complete rest is not advisable but it is important that you prevent putting the wrist under strain in the early stages of healing. 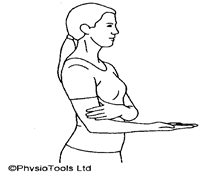 Ensure you continue to move the shoulder and elbow as normal as it is common to quickly become stiff in these joints. There are many different ways in which ice can be applied. Whatever method you choose it is important that you wrap the ice in a damp towel to prevent burning the skin. Ice should be applied for 20 to 30 minutes every 2 hours. Only use an ice pack on areas that have normal skin sensation i.e. where you can feel hot and cold. Do not apply over an open wound. Do not apply an ice pack to an area that has poor circulation. the area becomes white, blue or blotchy. the area becomes excessively painful, numb or tingles. If you have been given a tubigrip to wear, it is important that it is removed if you develop any signs of poor circulation; pins and needles or numbness. In addition it should be removed when you go to sleep. If you have swelling in your wrist or hand sit on a chair and place your elbow on cushions so that it is level or slightly higher than your shoulder. In this position, point your hand towards the ceiling then open and close your hand as this will help to reduce any swelling further. Consuming alcohol, massaging the injured area and applying heat can all be detrimental in the early stages of healing and therefore should be avoided. If you follow this basic advice your injury should take around 6 weeks to heal. However, everyone recovers from injuries at different rates and it is dependent on the severity of the injury and the presence of any other medical problems. It is possible that you may be back to normal in 2 weeks however it is also possible you may suffer symptoms for up to 3 months. After 72 hours it is very important you try to start using your wrist and hand normally again when doing everyday tasks like washing, dressing and eating. The exercises below will help you to regain full function, flexibility and strength and you should try to practice them 10 times, 3 – 4 times per day. Without moving your forearm, slide your hand one way and then the other. Hold 10 seconds in each direction. 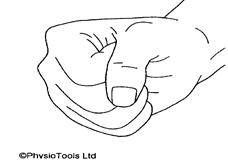 Turn your palm as far as possible upwards, without moving your elbow, hold for 10 seconds. Now turn the hand back over again as far as possible, hold for 10 seconds. 4. Touch your thumb to the tip of each finger. 5. Support your elbow on a table with your wrist straight and fingers pointing towards the ceiling. 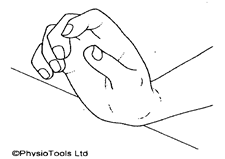 Bend your fingers into your palm as tightly as you can and feel them stretching. Hold the stretch 10 seconds. 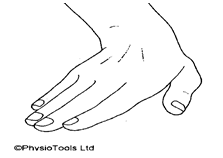 Now stretch your fingers as wide as you can and feel them stretching. Hold the stretch for 10 seconds. 6. Hold your hand with the palm of your hand facing upwards. You may experience more discomfort when you start the exercises however this is normal and does not mean you should stop. If your symptoms remain worse for more than 2 hours after the exercises, then you should decrease the number of each exercise that you do and build up again slowly. Repetitive wrist and hand movements and lifting objects heavier than a teacup should be avoided to begin with. However, as your movement improves and pain reduces, little by little you can increase the amount of weight that you are able to lift. Progressing from lifting a tea cup to a heavy shopping bag for example would not be advisable, as is likely to result in overloading of the soft tissue and could consequently lead to further injury. If your job involves regular activities using your wrist and hand you must ensure that you practice similar tasks so that you build your strength and function up gradually. If you participate in an active hobby then it is advised that you do not return to this until you have full strength, full range of movement and you can use your wrist normally without experiencing pain or swelling. If you play a sport, practice specific activities like throwing a ball to prepare the wrist and hand and build this up gradually before returning to full training sessions and competition. 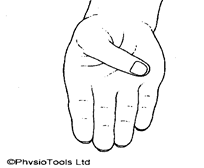 If ten days following your injury you are still unable to use the wrist or hand and it remains painful and swollen, despite following the above advice, please contact the physiotherapy team on (01482) 608939. If there is no answer, please leave a message and clearly state your full name, address and telephone number and we will get back to you as soon as possible.